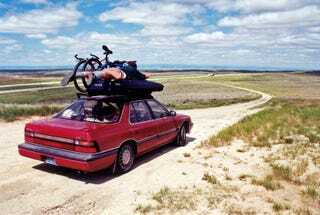 Setup: You’ve got a year or so to work/travel in Canada and want a car but only have a beater budget: what do you buy?? Budget: $3000 Canadian inc taxes which is more like $2500 before you pay HST and licensing. Brief: you came over with a backpack, you have no tools, no garage, no local mechanic or buddies with welders, oh and you’re broke as a joke working short term casual jobs. Car should probably be at a dealer since you just moved here and have no idea how licensing works. You want to explore the vast open spaces of North America and there’s a Canadian winter coming: needless to say reliability and is your #1 concern here followed by cheapness to keep running. Manual shift is fine and bonus points if you can camp in it.